My husband and I decided early on that, come our senior years, we didn’t want to end up like our parents—his in one of the thousands of indistinguishable, “over fifty,” planned communities in Florida, or mine in the same small town they grew up in. Their daily lives followed a pretty set routine: seeing the same people they’d known for years, driving the same roads, shopping in the same stores, eating the same foods, wearing the same clothes, and living in the same house. As they got older, they did less, and less, and their lives became even more restricted. My own father developed dementia and ended up needing assisted living and finally in a nursing home after we could no longer care for him. This didn’t seem like “golden years” to us, more like a long drawn-out death sentence. So we started thinking about our options. If we could live anywhere in the world we wanted, where would that be? What would our daily lives be like? What kind of home would we have? We read countless books and magazines, including publications by Live and Invest Overseas, did extensive online browsing, made endless lists, and traveled to all the places we could… until we ended up here in the jungles of Tulum, Mexico—in the dream home that we designed and built. The world is a pretty big place, and choosing a new home from across the globe can be overwhelming. So, how did we come to the decision to choose this specific locale and development? First, we needed to decide whether to stay in the United States or move abroad. That one was easy for us. We knew we wanted something different from the norm, something exciting and new. Second, we had to figure our budget. We hadn’t yet retired, so we weren’t sure how much savings we’d end up with. We simply made the assumption that we’d have the least possible savings and that we would live on our Social Security income. I can’t stress enough how important this step is. We live quite comfortably because of it, but we know too many friends who assumed the best and ended up having to leave their dream behind after they ran out of money. With this in mind, we figured we should look at countries with a low cost of living. Third, we needed to look at how far away from family and friends we wanted to be. We still have young grandchildren, so it was important to us to be within a relatively easy and inexpensive plane ride away. Next, we asked ourselves if we would be comfortable learning a new language. We were and are eager to learn but we also knew that, realistically, moving somewhere with no English speakers would be more of a challenge than we wanted to take on. That brought us to infrastructure. Could we deal with a Third World country or a remote town with little to no shopping, medical care, safety, or Internet? A resounding NO for us. We wanted exciting, not primitive. And what about the weather? Coming from Philadelphia and some crazy winters, we knew we never wanted to see another pile of slush. We wanted sunny and warm year-round. With this list of priorities in hand, we were able to start crossing off our list the many places we had traveled to and loved. The south of France was too far away and too expensive. Forget snowy Canada. The south Pacific—way too far away, as was Australia and all of Asia. Keeping our initial list in mind allowed us to quickly narrow the field to a few places: Mexico, the Caribbean, Central America, and northern South America. Now we were getting somewhere. We had some great places to take a closer look at. What were some of the things we really desired—in our dream of dreams? That was our next list. We both wanted beaches… but a very specific kind of beach: palm trees and white silky sand. A pool of our own. Lots of privacy. A single family home big enough for parties and having all of the children and grandchildren over at one time. Close enough to good shopping and food. We love to eat, cook, and entertain and try new restaurants, so nothing too remote. After this step, we were left with a pretty short list: Mexico, Belize, Costa Rica, and Ecuador. We had vacationed up and down the Yucatán Peninsula many times and really loved it there, so we knew that was the area of Mexico we wanted. We had only visited Belize and Costa Rica a couple of times, never extensively, and we’d never been to Ecuador at all. Time to start traveling, but first we decided to attend a conference in Cancún. Perfect, we thought, we’ll investigate Mérida and the Gulf Coast and see the presentations on the other countries on our list. Which is exactly what we did. We rented a gorgeous home in the old colonial section of Mérida and then a beautiful beach house in Telchac Puerto on the Gulf. Though we loved things about both, we easily ruled them out. My husband hated the Gulf—it just wasn’t his beach. And neither of us could abide the noise and congestion of Mérida. We knew then that we wanted somewhere in Quintana Roo—the Caribbean coast of the Yucatán, from Cancún down to Chetumal, or somewhere in the other three countries. During the conference, we were able to rule out Belize (too small for us) and Costa Rica (too expensive). Near the end, we wandered through the exhibit hall where various vendors and real estate tours had set up booths. There were several new developments in the area offering free tours to their places nearby, so we figured we should at least check them out. Voilà! We fell head over heels for one of the developments and bought a lot the next day. That was three years ago and there has not been a moment of regret. We are deliriously happy in our four-bed, five-bath home with pool, off the grid in the jungle and 15 minutes from the world’s most beautiful beaches… and no less than 221 restaurants. We’ve checked off everything on all our lists and added a few things we didn’t know we wanted—like being off the grid with monkeys, toucans, and our own banana grove. 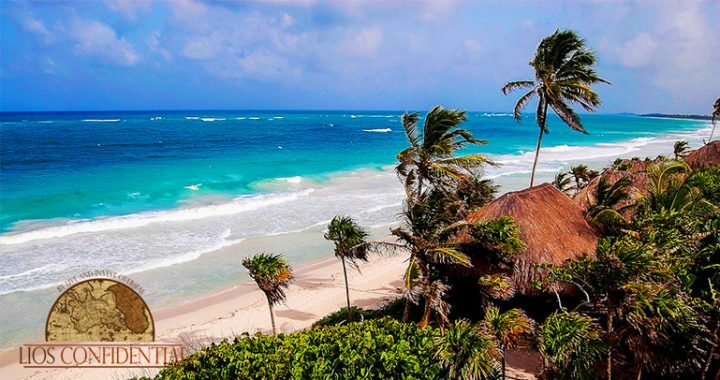 Life is grand in the jungles of Tulum! 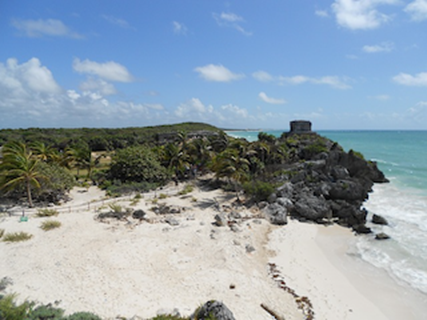 Posted in Live And Invest Overseas Confidential and tagged Dianne Harper, Mexican Riviera, retire to mexico, retire to tulum, Riviera Maya, tulum.